Phosphodiesterase 10A (PDE10A) is a double substrate enzyme that hydrolyzes second messenger molecules such as cyclic-3’,5’-adenosine monophosphate (cAMP) and cyclic-3’,5’-guanosine monophosphate (cGMP). Through this process, PDE10A controls intracellular signaling pathways in the mammalian brain and peripheral tissues. Pharmacological, biochemical, and anatomical data suggest that disorders in the second messenger system mediated by PDE10A may contribute to impairments in the central nervous system (CNS) function, including cognitive deficits as well as disturbances of behavior, emotion processing, and movement. This review provides a detailed description of PDE10A and the recent advances in the design of selective PDE10A inhibitors. 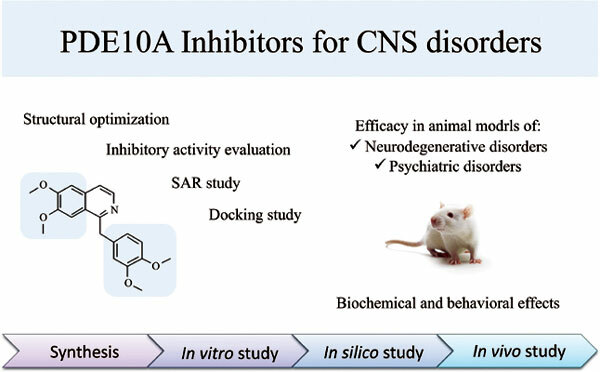 The results of preclinical studies regarding the potential utility of PDE10A inhibitors for the treatment of CNS-related disorders, such as schizophrenia as well as Huntington’s and Parkinson’s diseases are also summarized. PDE10A inhibitors, second messenger system, SAR study, CNS disorders, papaverine-related compounds, isoquinoline.